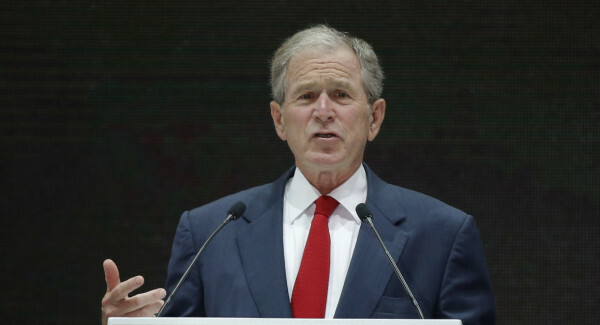 The mask is slipping on George W. Bush and you are beginning to see some of his true personality here. I used to genuinely like Bush. I think he did a horrific job towards the end of his term, spending us into oblivion and going whole hog on Amnesty. I think Iraq was the wrong target… he should have gone after Iran and Saudi Arabia. He did hold the country together after 9/11 and was loved by the military. I don’t think you can lay blame on Bush for 9/11 or the lax national security that was at the root of the incident – Bush had just come into office at that time. The blame for all of that can be squarely laid at the feet of Bill Clinton. But Ted Cruz is a different matter. It must have really hurt Cruz when Bush came out and said he hated him. Cruz worked on Bush’s 2000 campaign and met his wife while working for Bush. To have him now opportunistically turn on Cruz and say things he knows are not true is petty and beneath contempt. Inside a sleek Denver condominium, George W. Bush let a hundred donors to his brother’s campaign in on a secret. Of all the rival Republican candidates, there is one who gets under the former president’s skin, whom he views as perhaps Jeb Bush’s most serious rival for the party’s nomination. It isn’t Donald Trump, whose withering insults have sought to make Jeb pay a political price for his brother’s presidency. It isn’t Marco Rubio, Jeb’s former understudy who now poses a serious threat to his establishment support. “I just don’t like the guy,” Bush said Sunday night, according to conversations with more than half a dozen donors who attended the event. One donor in the room said the former president had been offering mostly anodyne accounts of how the Bush family network views the current campaign and charming off-the-cuff jokes, until he launched into Cruz. Bush took a harsh view of Cruz’s apparent alliance with Trump, who stood with the senator at a Capitol Hill rally last month in opposition to the Iran deal. While Trump, the current GOP poll leaders, has attacked most of his competitors in the 2016 field, he has avoided criticizing Cruz. One donor, paraphrasing the former president’s comment in response to a broad question about how he viewed the primary race and the other Republican candidates, said: “He said he found it ‘opportunistic’ that Cruz was sucking up to Trump and just expecting all of his support to come to him in the end,” that donor added. While Jeb Bush’s campaign is spending far more time of late pushing out information that contrasts favorably with Rubio, his oldest brother seemed to see Cruz as the biggest threat in the end. According to several donors, the former president said not to doubt Cruz’s strength. “He said he thought Cruz was going to be a pretty formidable candidate against Jeb, especially in Texas and across the South,” a donor said. A spokesman for the former president pushed back at the takeaway that he views Cruz as his brother’s main obstacle in the 15-candidate primary field. Cruz’s campaign, after initially declining to comment for this story, provided a statement from the senator Monday night. The donors at the event were a mix of establishment stalwarts like former Gov. Bill Owens and business executive Larry Mizel as well as a number of young professionals, who were offered reduced $250 tickets at the last minute in an effort to fill the room, according to an email the organizer circulated among potential supporters and obtained by POLITICO. Bush is still pushing Amnesty. He knows it is destroying the country, but it brings in Marxist votes and cheap, slave labor. He hasn’t changed his tune one bit. He’s doubling down. Cruz is not doing this for personal gain. He’s the lone voice in the Senate standing for the right thing and for that he is shunned and disparaged. He stands for God and the Constitution and is hated for it. Those inside the beltway claim he doesn’t play well with others to get along… that’s not what I want in a leader. I want someone who has the courage of their convictions and will stand alone if need be, risking all to do what is needed. That is Ted Cruz. It certainly isn’t the Bush clan. The bit about the Bush’s not being self-serving is laughable. The family has been entrenched in politics forever. Bush’s father was the head of the CIA and they made their money in pharmaceuticals and oil. I don’t begrudge them that… that’s business and very American. But to act as though they are some paragon of virtue is just ludicrous. Cruz didn’t hijack the GOP – the GOP deserted the American people and they have no idea what their own base really wants. That’s the real threat to a RINO like Jeb Bush – they fear Tea Party conservatives like vampires fear holy water.